Hey lunch packers! 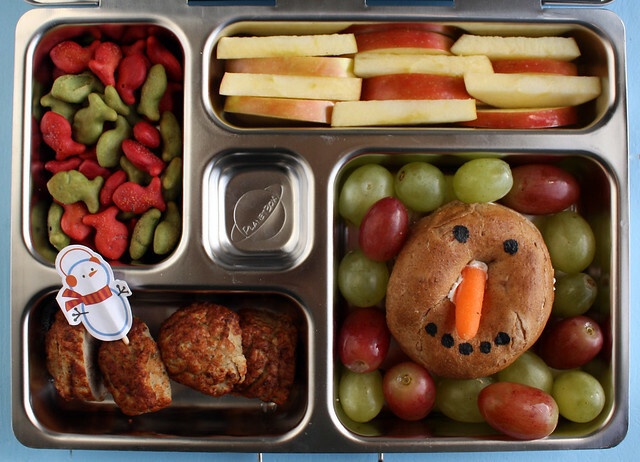 Welcome to another week of bento lunches for the Copley family. 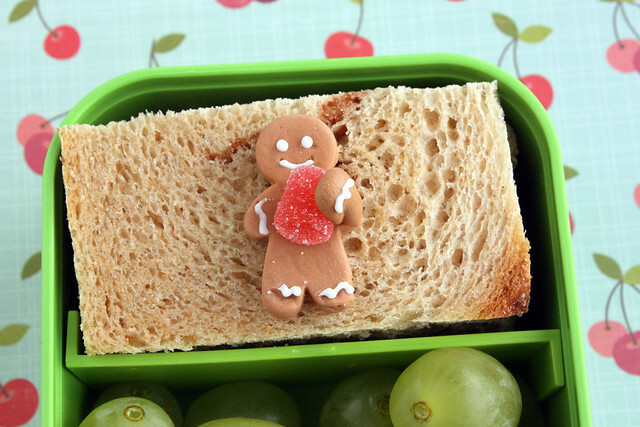 Before we dig into this week’s meals, I wanted to post a quick announcement for those of you who may have missed it when I mentioned it over on the Facebook page: I’m thrilled to tell you that I’ve just wrapped up the bulk of the work on a bento how-to book! It will be published by Tuttle Publishing later in 2013. 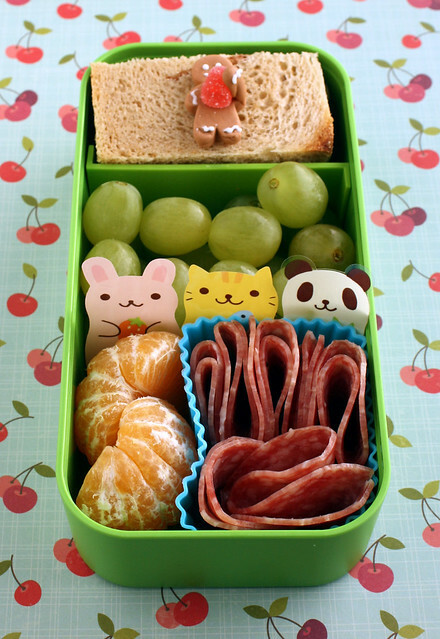 The first bento of the week was not actually a bento at all. Augie is back home with me on Mondays now that I’ve met my deadline so he had a simple lunch at home with me. 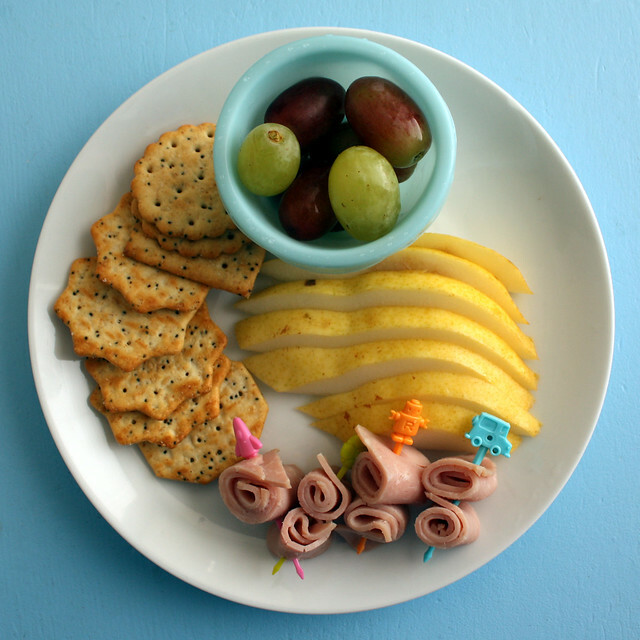 His lunch was: grapes, crackers, pear slices and deli ham that I rolled up and put on some toy themed decorative picks (the robot is my favorite!). 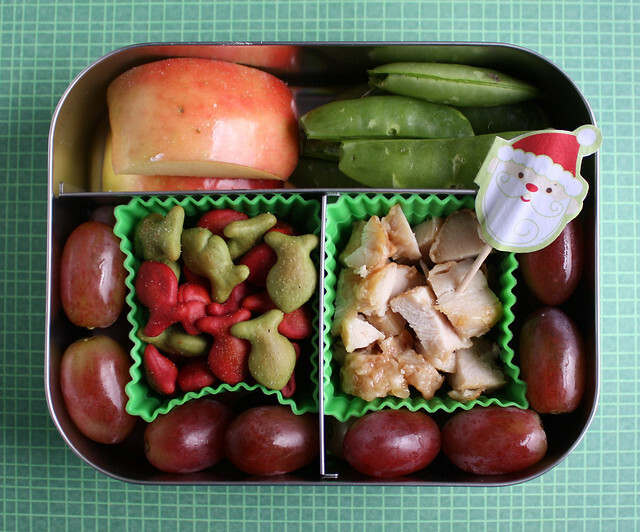 Wyatt’s lunch was packed in our PlanetBox : Christmas colors Goldfish crackers (I found these at Target), apple slices, grapes, a mini-cinnamon bagel with cream cheese and a few turkey meatballs from the freezer. I decorated the bagel to look like a snowman with food-safe markers and added a piece of carrot in the middle for a nose. I don’t think this looked particularly snowman-ish though. Maybe it needed a hat? The nose seems weird too for some reason. 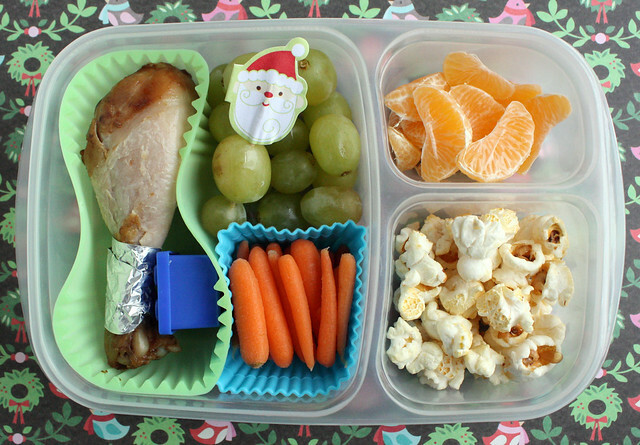 On Tuesday, Augie had apple chunks, sugar snap peas, grapes, Christmas Goldfish and some leftover lemon chicken from our book celebration dinner. This was packed in our Lunchbots Trio. Wyatt also had leftover Chinese food: sesame beef and rice in the thermos along with some apple chunks and a side of raisins. I forgot to take a picture though. 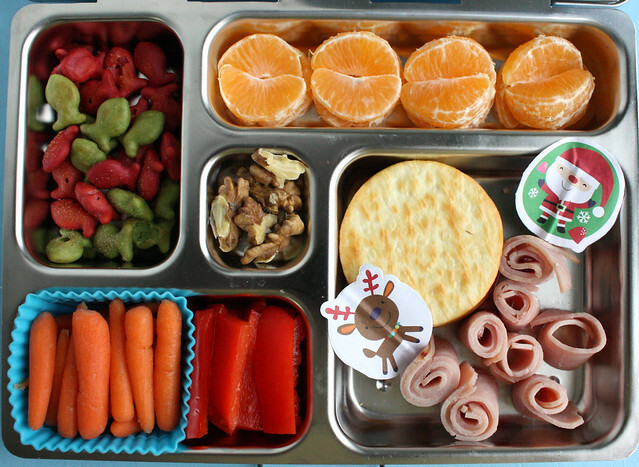 On Wednesday, Augie had red and green Goldfish crackers, clementine wedges, carrot sticks, bell pepper strips, a few walnuts, crackers and some deli ham roll-ups. Wyatt was home sick so no packed lunch for him. Augie had leftover hoisin chicken from SOS! The Six O’Clock Scramble to the Rescue (one of my favorite cookbooks), some grapes, carrots, a little hummus for dipping (in the blue box), clementines and some kettle corn. This was packed in an EasyLunchboxes box . 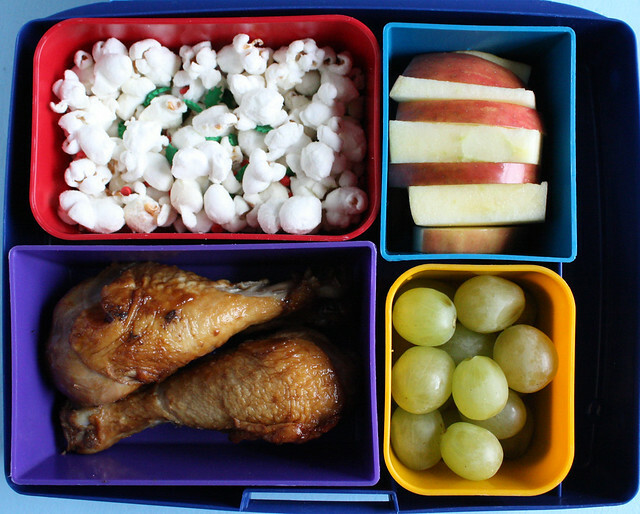 And Wyatt had this lunch packed into our Laptop Lunches bento: white cheddar popcorn, apples, grapes and hoisin chicken. I tried sprinkling some holly sprinkles on the popcorn but most of it just fell through to the bottom. If you look closely you might be able to see it though.